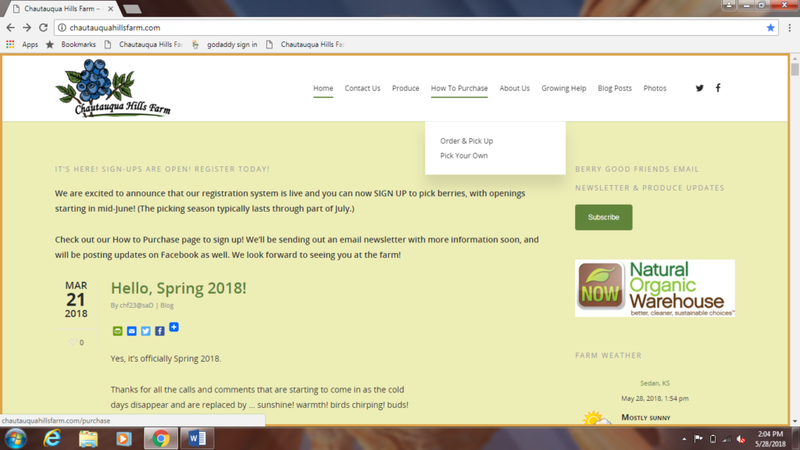 Website Updates: How to Register to Pick or Order Berries! 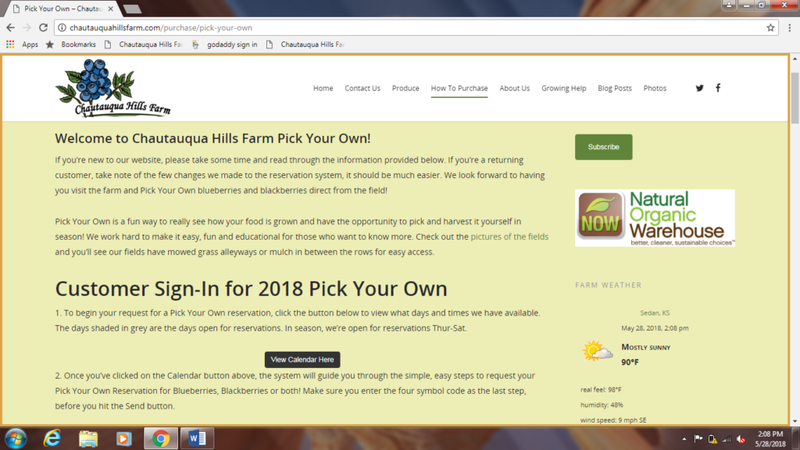 As you may have noticed, we’ve made some changes to the website, and we wanted to provide you with updated information on how to sign up for berry-picking reservations, as well as register for order & pickup. Step 1: Start by selecting the How to Purchase at the top of the page. 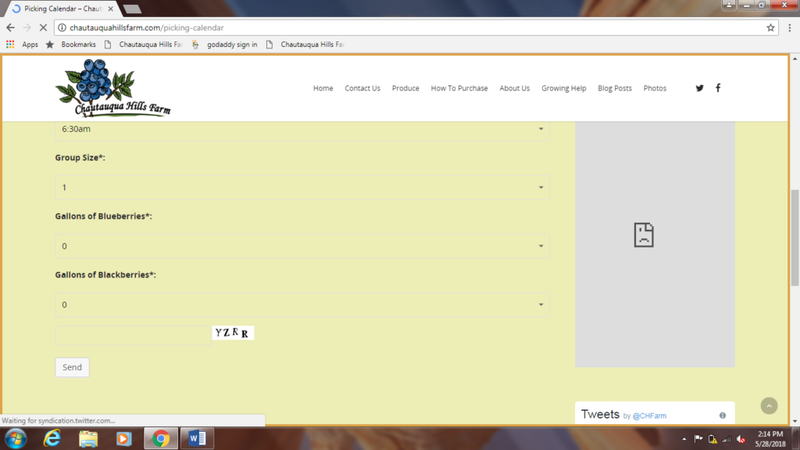 Step 2: If you select Pick Your Own, you’ll be directed to the page below. 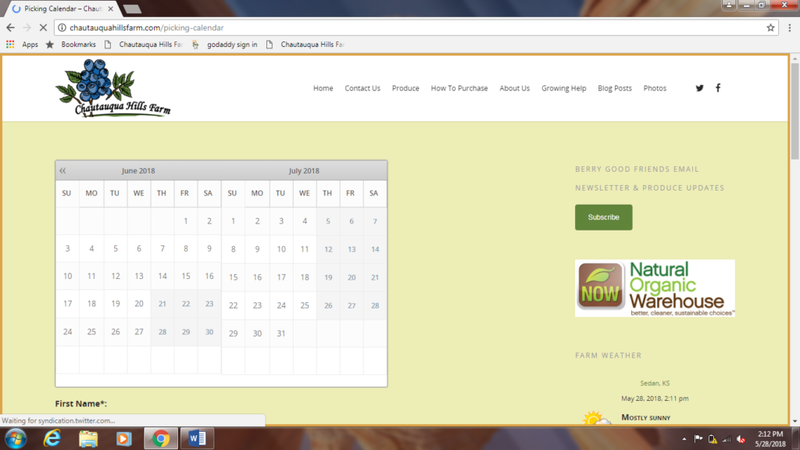 Click on the View Calendar Here button in the middle of the page, where you’ll be directed to the calendar. Step 3: Select the day you’d like to pick from the days available (Thursday – Saturday, in season). Step 4: Complete the form directly below the calendar. Step 5: Make sure you enter the four digit code that is displayed (YZRR in the example above) before you hit the send button. It’s that easy. We’ll check your reservation request, make sure it’s a valid day and that we have plenty of ripe berries available for you, and then will send you a confirmation email (it may take us up to 24 hours to respond). Along with your confirmation email, you’ll receive information and directions to our farm. You’re all set! We’ll see you at the farm. 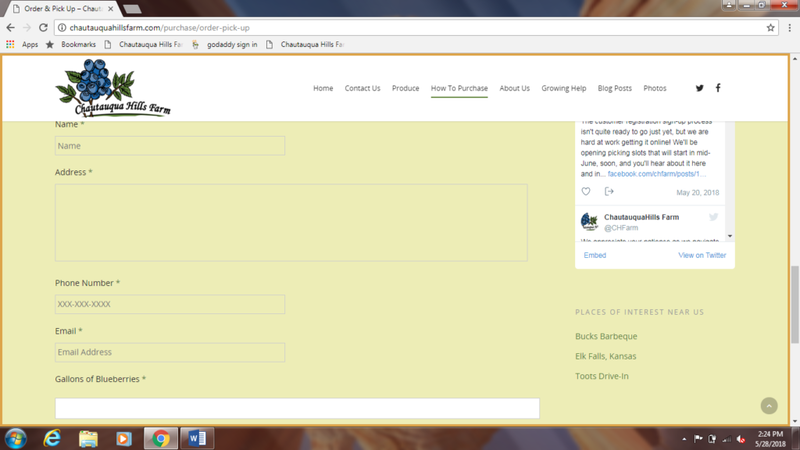 Scroll to the bottom of the page, and enter your information. Complete your information, including how many gallons of blueberries you’d like to purchase, and submit. Done! 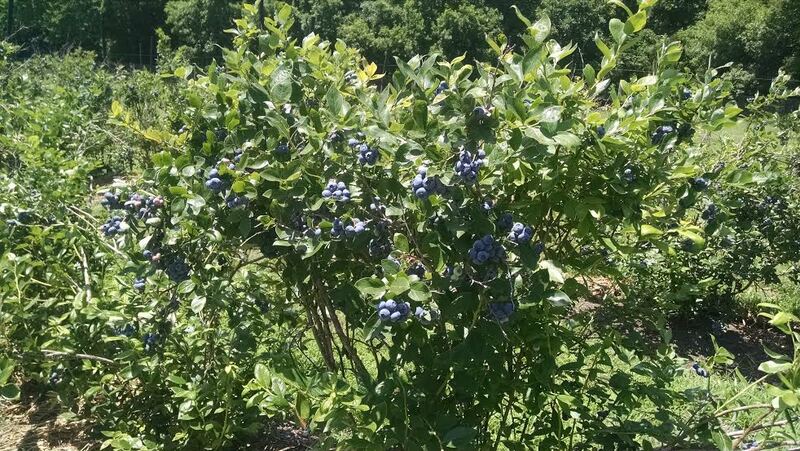 Thank you again for choosing Chautauqua Hills Farm for your naturally-grown blueberries. We hope you find the changes to our site an improved experience, but as always we’d love to hear your feedback. Yes, it’s officially Spring 2018. Thanks for all the calls and comments that are starting to come in as the cold days disappear and are replaced by … sunshine! warmth! birds chirping! buds! 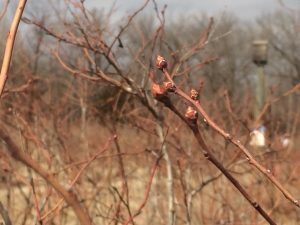 We’ve been working hard to get our pruning finished to ensure we have a strong crop of berries for this summer’s harvest, and while doing so, we’ve observed plenty of good bud production. 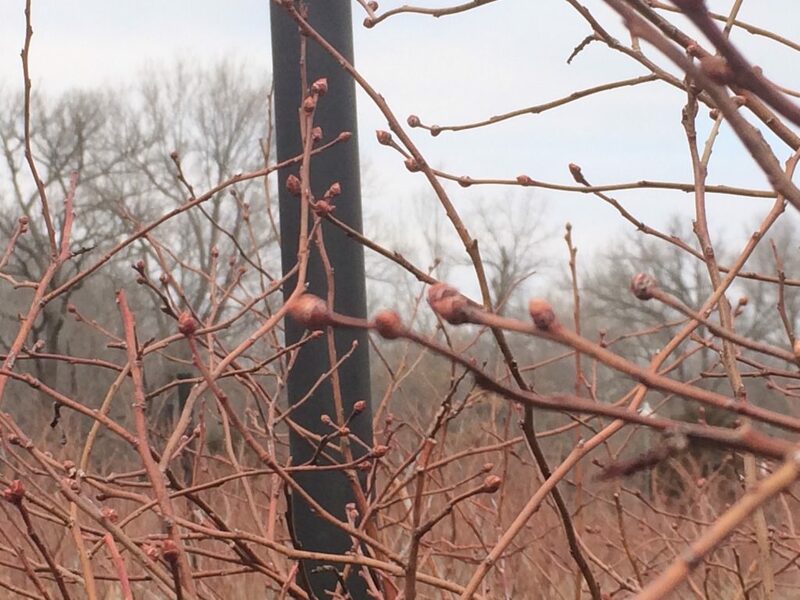 As many of you know, blueberry plants set their buds in the fall, and barring any really nasty winter weather, remain dormant until late March or early April. This year’s bud production looks to be shaping up really well. 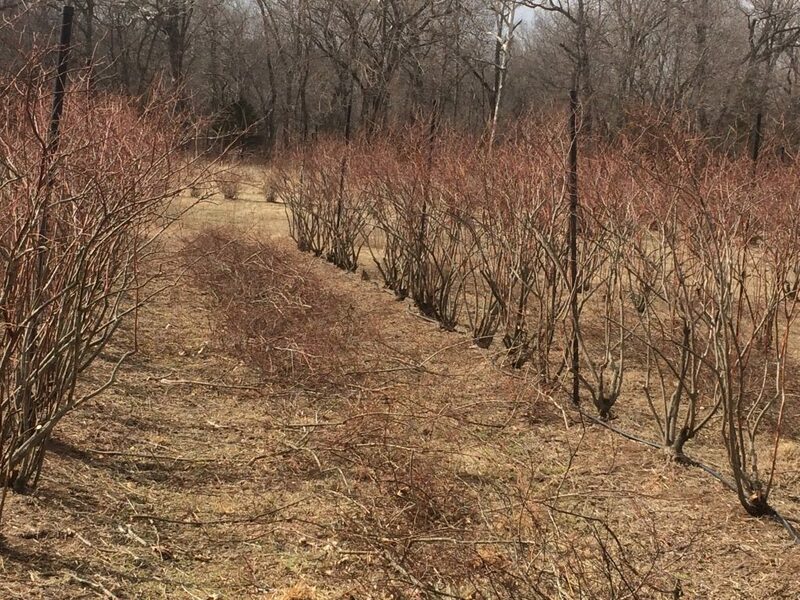 We planted another 125 bushes last fall, and even though it’s been a particularly dry winter, they’re showing a lot of promise. If you recall, we also planted over 300 new plants in 2015, and from early observation, they should contribute to this year’s harvest. We’re as excited as you for the season to get open and on its way. Our reservation system will have a little different look to it this season, but beginning May 1st, it will be open for reservations. More information to come, but the berries go fast, so make your reservations early so you’ll be sure to get what you want. If you prefer to pick your own, we’re excited to get to see you again this year, and our days of operation will be Thursday, Friday and Saturday for reservations. The reservation process is to ensure there’s enough ripe berries available for you on the day you’re out, and that it’s a fun and pleasant picking experience without too many people on any given day. As always, this is a really busy time of the year for us as we prepare for the season, so if you call or text, and don’t hear back from us right away, please be patient, and know that we’ll respond when we can. We’re looking forward to seeing all our “Berry Good Friends” at the farm! Spread the word, and bookmark our website and Facebook page to stay up-to-date on farm news and the season opening! We’re “Berry” Close! Reservations Open May 1st! The 2017 berry season is fast approaching, and we’re excited to finally have an update for you! Did we even have winter this year? It was so mild, it was quick, it was warm, and there was very little moisture! Drought and wildly swinging temperatures were the norm, and then seemingly overnight, spring arrived. The beginning of April brought over 2” of rain, added to the rain we received earlier that week, and we’re about even for the season. 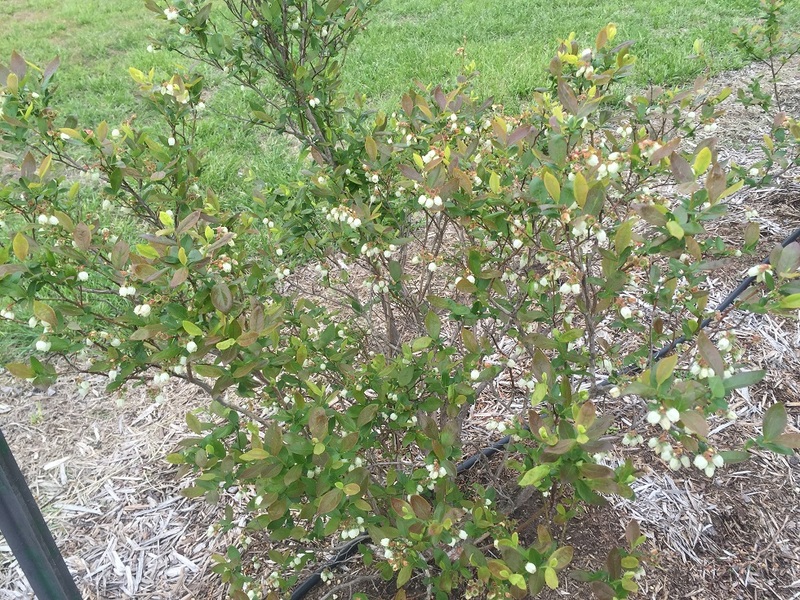 The berries are loving it. 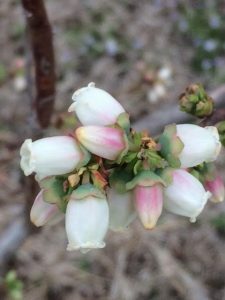 You can see in the photos below, the earlier-fruiting bushes are already in bloom, and the later varieties are displaying a good volume of buds. The 2016 season may have been the most disappointing season ever. A late April freeze, followed by a severe hail storm weeks later, really reduced our harvest and what was available to pick. 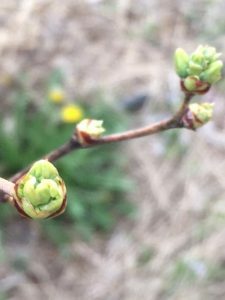 However, with the new spring rains, and the buds we’re seeing on the 350 additional bushes added in 2016, this year’s season looks to have a lot of good fruit. Progress is coming along on the new field. 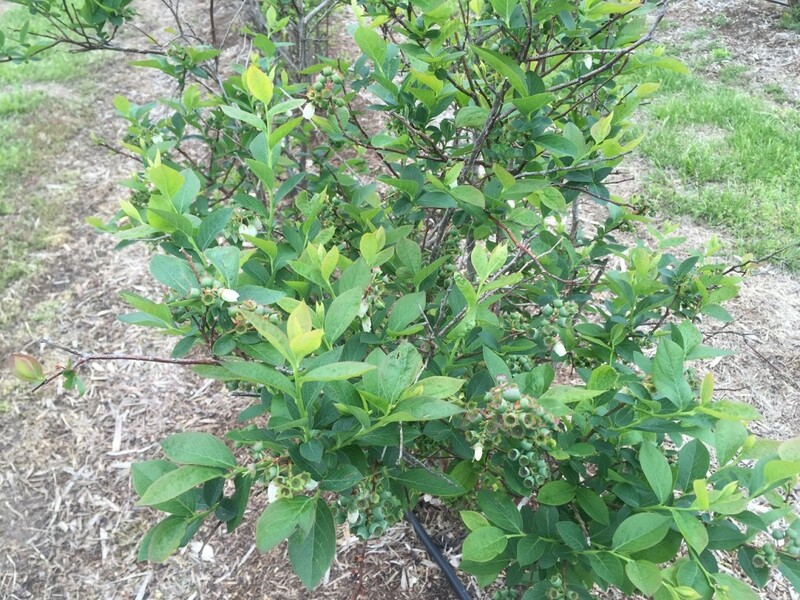 Making sure the soil has the right PH balance and nutrients for healthy blueberry bushes takes a year or two, and if our soil tests come back positive, we’ll be adding plants in the new field this fall. 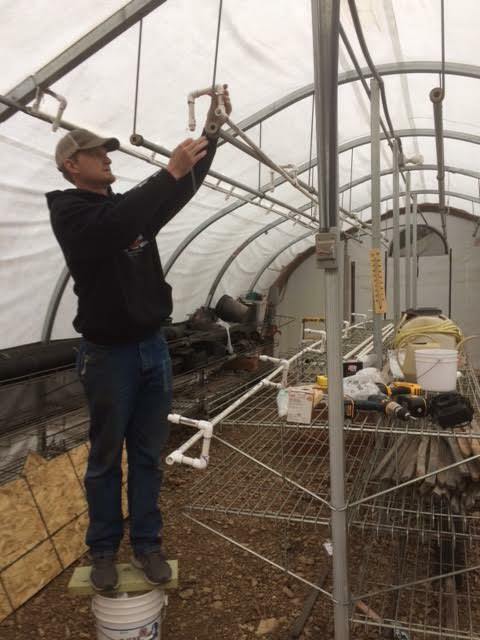 In the photo below you can see Ethan fixing the irrigation system in the greenhouse. Plants slated for the new field will first spend time in the greenhouse where we can properly prepare them before transplanting to the new field. As always, we’re as excited as you for the season to get open and on its way. Beginning May 1st, our online reservation system will open. 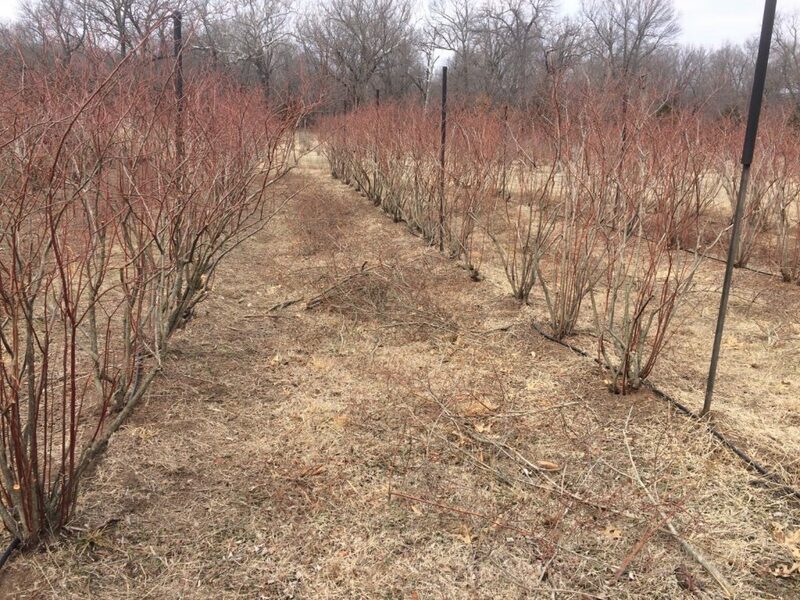 If you prefer to use our Order & Pickup Service to either pick your berries up at the farm, or at Piccadilly Market & Grill in Wichita, then beginning in May, get your order in early, and we should be able to fill your request when the first berries are ripe, usually the first week of June. If you prefer to pick your own, we’re excited to get to see you again this year, and as always, we’ll be open Wednesday, Friday and Saturday for reservations. The reservation process is to ensure there’s enough ripe berries available for you on the day you’re out, and that it’s a fun and pleasant picking experience without too many people on any given day. Thursdays are open for picking with no reservations required. We’ve been receiving plenty of calls and texts about this year’s season. It’s a really busy time of the year for us as we prepare for the season, so if you don’t hear back from us right away, please be patient, and know that we’ll respond when we can. They’re Back! Berries, Berries Galore! After a slight delay to our season start due to all the rain and cooler temps we’ve had, we’re nearly ready to have Our Berry Good Friends come join us again at the farm for the delightful task of picking delicious blueberries. We know you have been eagerly awaiting an opportunity to refill your freezers and start baking and tasting these fantastic, good-for-your-brain healthy treats, and it’s finally here! 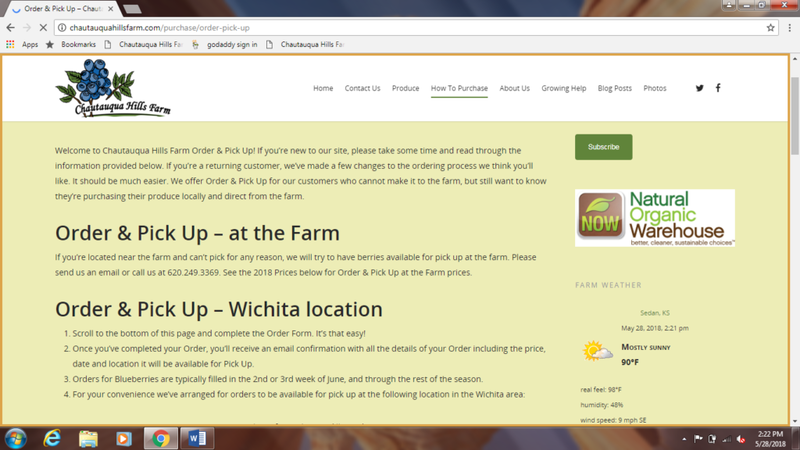 We’ve opened our online customer sign-in portal for you to start choosing and making reservations for your preferred pick dates (and placing online orders for pick up in Wichita), and our first official day of picking for the 2015 season will occur on Friday, June 19th. We’re sure you’ll be happy to hear that we’ll be extending the Pick Your Own season a little longer than usual (July 18th) because of the delay in ripening this spring, which means even more time to come back and check us out again a little further down the road once more varieties have ripened up! If you were curious about blackberries, stay tuned, as we’re still watching them for ripening time and availability. We expect them to ripen up in quantity near the end of June and continue to produce for about two weeks after that. We’ll know more in about 1 week and will post an update here once we do. As always, thanks for visiting the website and the farm, and for spreading the word about our delicious berries! See you soon! The 2015 Berry Season is Approaching! We’re up and running once again here in 2015 at Chautauqua Hills Farm! 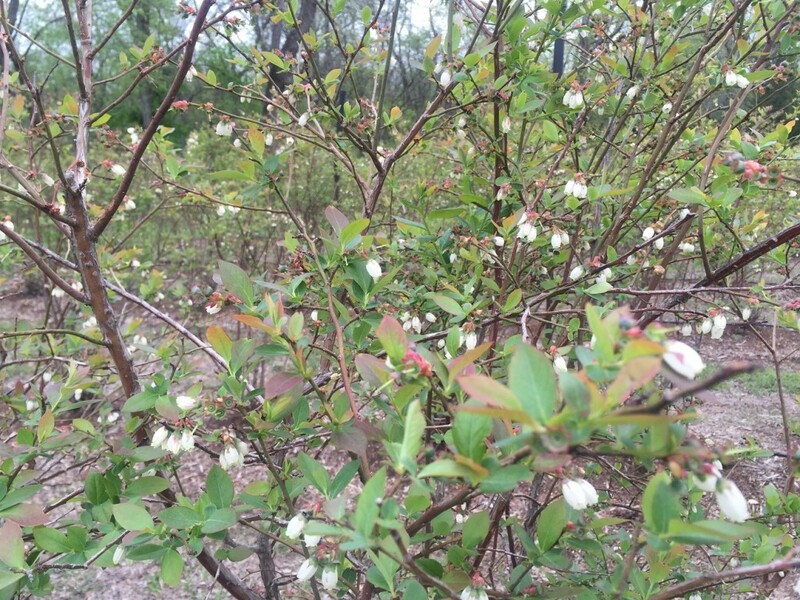 As you can see from the video and pictures below, the blueberries are looking good. Also, with the milder winter, the blackberries are looking good too. Yes, it looks like we’ll have blackberries this year! As a side note, we have decided to cease offering Asparagus and Garlic going forward. But we think our blueberries and blackberries are pretty awesome on their own, and we know you agree! Based on what we can see right now, the season looks like it will open up around the same time as last year – June 10th or so. We’ll keep monitoring things and will begin regularly updating the website and sending out occasional e-newsletters again, so stay tuned. Thanks for reading and for your support and enthusiasm in spreading the word about Chautauqua Hills Farm! © 2019 Chautauqua Hills Farm.